Please do not park in front of the neighbors’ houses, but use the lot across the street. Our expenses are low, but we do depend on the generosity of participants to cover them. There are containers for dana (donations) to the teacher and one for our expenses. Remove your shoes before entering. Enter quietly and gassho (bow from waist with palms & fingers pressed together). and sit facing toward the wall with your eyes open in soft focus. At 6:30 the doan will sound two bells, signaling kinhin. 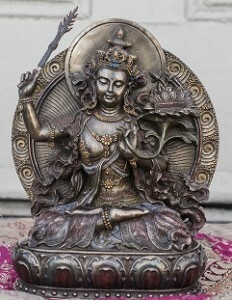 Bow, rise, bow to cushions, and bow to the center of the room, turn to walk clockwise with hands in shashu position (right hand covers left hand, held close to the body at diaphragm level). With each exhalation, take a half step with downcast eyes. If you arrive during kinhin, blend into the line of walkers and wait to arrange your seat at the end of kinhin. When the single bell sounds (after 10 minutes of kinhin), walk quickly back to your place. Gassho to the cushion/chair, gassho to the center of the room, and take your seat facing the wall. 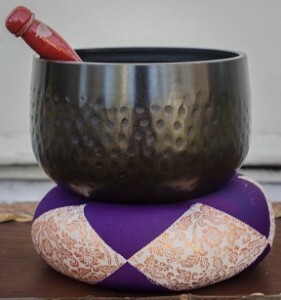 Three bells signal the beginning of a 40-minute silent meditation. One bell marks the end of zazen. If you arrive during this period, please feel welcome but be as quiet as possible as you take your seat. 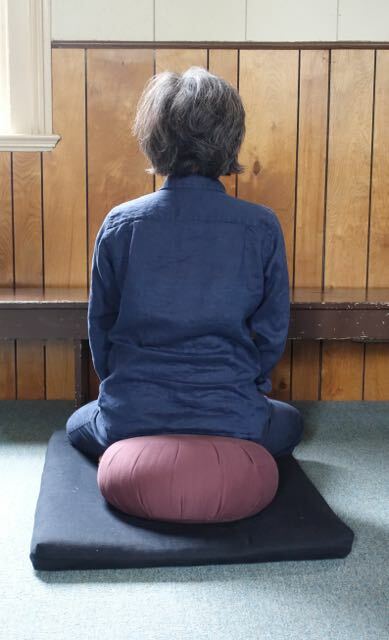 Zazen is “just sitting” with a straight spine, balanced and relaxed, with no gaining idea or object of meditation, being completely aware of being a body/mind in the present moment. Rise from your cushion and fluff/straighten it out. Gassho to your seat, then to the room. On 3 big bells from the doan, offer three prostrations or standing bows to the altar. Chant “The Heart Sutra” facing the center of the room. On 3 small bells, perform three prostrations to the altar. The teacher will then bow without a bell, and step back. chair), and all finally bow to each other in shashu before sitting down in a circle together. Move your seat to form a circle with teacher at the head. We offer a short chant before the talk with hands in gassho. The teacher presents a topic, usually an ongoing study of a text, and discussion follows. We end the talk with announcements and a one minute sit, followed by a recitation of the “Bodhisattva Vows,” hands in gassho. Then rise, bow to chair or cushion, bow towards the center of the room, and help rearrange chairs before leaving. Join the group Floating Zendo Zazen to receive event notices.